We will take a look at the Ariston GL4S Electric Mini-Tank Water Heater by Bosch Thermotechnology in this review. It aims to deliver hot water supply right when you need, minus the waiting time, by keeping four gallons of hot water ready for consumption. Back in the day, water heaters consume the biggest chunk of energy consumption in a regular household. Traditional water heaters consume energy 24/7 as it heats and reheats the water stored in the big holding tank. However, thanks to the advancement of our technology today, we now have mini-tank water heaters or even tankless ones. If you are trying to find a mini-tank heating appliance for water that you can use by itself or connected to a larger one, then this post is for you. The Ariston GL4S will ensure that hot water is readily available without the huge energy consumption level that traditional water heaters have. This model can be installed and connected directly to the cold water line or an in-line with a bigger heated water source. The Ariston GL4S in an improved version of the Ariston GL4. With this new model, you will find a temperature adjustment knob that is easily accessible compared to the one found in the previous version. This new model also has an upgraded thermostat for a more accurate and consistent supply of hot water. This newly improved model weighs 17 pounds and measures 14 x 14 x 12.5 inches. Its glass-lined body sports a compact design that fits perfectly on small- to medium-sized kitchens. It can also be easily installed as it does not require any hardwiring—all it needs is a 15A standard outlet, and you are all set. Another added feature of the Ariston GL4S is a pressure-relief valve to ensure that you get the perfect flow of water that matches your specific needs and personal preferences. Because of its smaller tank compared to what traditional water heaters have, the Ariston GL4S is also more energy efficient. The mini-tank eliminates the need to wait and waste water and energy while waiting for the system to heat up the water like what usually happens in a tankless water heater. Moreover, the Ariston GL4S also helps in lessening the energy consumption as it would not need to heat and reheat a large amount of water 24/7 as what happens with a traditional water heater. Additionally, it also has standard 1.5-inch fittings, which makes it compatible with most plumbing fixtures. The fact that it runs on electricity makes it safer to use as compared to water-heating systems that run on propane. If you want a mini-tank water heater that runs on electrical energy, then the Ariston GL4S Electric Mini-Tank Water Heater is perfect for you. It is manufactured by one of the leading brands in this industry—Bosch Thermotechnology. This new and improved version of the Ariston GL4 has an easily accessible temperature adjustment knob and an upgraded thermostat. This combination results in a more consistent hot water supply in the temperature you prefer. It also has a pressure-relief valve that you can utilize to adjust the water pressure level to your liking. This mini-tank has standard-sized fittings that are compatible with most plumbing fixtures. Additionally, would also only take a couple of minutes to install this newly improved Ariston GL4S by Bosch Thermotechnology. Additionally, because it runs on electrical energy, the Ariston GL4S is safer to use compared to the propane-run traditional water heaters. The problem with this model is that it requires its own 15A outlet. Also, some may find that a four-gallon water tank is not enough to supply their needs. Bosch’s Ariston GL4S is definitely among the top electric, mini-tank water heaters in the market today. It boasts a set of features that are hard to match. 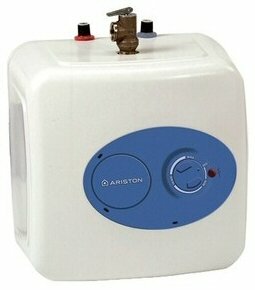 One great contender of Ariston GL4S when it comes to features and price is the Eemax EMT4. Similar to Ariston GL4S, the Eemax EMT4 also runs on electricity and has a four-gallon capacity. You can set the water’s temperature through the use of its temperature adjustment knob. It has a wide range that covers 50 degrees to 140 degrees Fahrenheit. Additionally, it was also intelligently designed to have 1.5-inch fittings. This makes it readily compatible with the plumbing fixtures you already have in your house. All in all, both electric, mini-tank water heaters offer features that you would expect to find in a reliable water-heating unit. They can provide a decent amount of hot water supply that is normally needed in a small- to medium-sized kitchen sink. However, we have concluded that the Ariston GL4S Electric Mini-Tank Water Heater is a better investment than Eemax EMT4. The Ariston GL4S Electric Mini-Tank Water Heater has a more compact design than the Eemax EMT4, making it easier to fit under the sink compared to the other appliance which measures 18.25 x 12.5 x 13 inches. Additionally, the Ariston GL4S is also more lightweight at only 17 pounds compared to Eemax EMT4 that weighs 24 pounds. The only dissimilarity between the two models is that the Ariston GL4S has a temperature range of 65 degrees Fahrenheit to 145 degrees Fahrenheit. On the other hand, the Eemax EMT4 can provide a hot water supply in temperatures ranging from 50 to 140 degrees Fahrenheit. At the end of the day, the choice depends on your own personal preferences and needs. Just make sure to perform a thorough research on what each model offers. This would guarantee that you get the most value for your money.